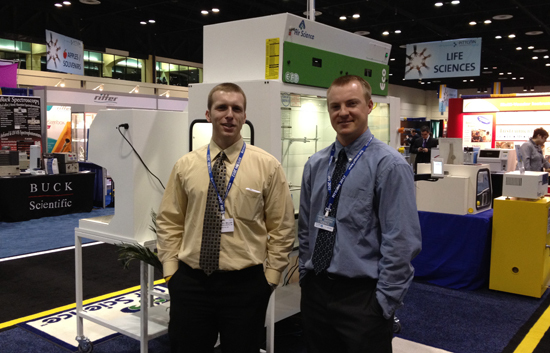 OffWhite’s Nat Miller, left, and Devon Kramer of Air Science, LLC, Ft. Myers, FL, pause in front of the Air Science PurairECO ductless fume hood at the 2012 Pittcon Exhibition in Orlando, FL. Miller, whose education and work history includes hands-on experience in the environmental sciences, met with Air Science management, sales staff and customers in the exhibit hall, gaining a better understanding of market demands for ductless fume hoods that offer significant advantages in energy reduction and overall sustainability. OffWhite continues to serve as the information architect for the complete line of Air Science products for analytical, educational and forensic science laboratories worldwide. 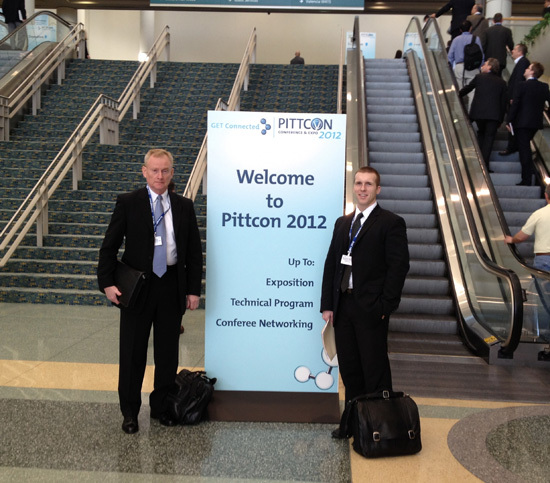 Dan Rose, left, of Stirling Ultracold, and Nat Miller, right, OffWhite, pause before entering the 2012 Pittcon Conference in Orlando, FL. Pittcon is one of the world's largest exhibitions of leading-edge scientific instrumentation and equipment. OffWhite continues to play an important role in client services and support by regularly attending this and other international meetings. In December 2011, Twitter released a "Brand Page" feature, allowing companies to customize their Twitter account page and even promote the "Tweet" that they want to appear most prominently to visitors. Twitter Brand pages provide functionality that businesses already promoting on Twitter are looking for, however for newcomers the idea of creating more content for yet another online presence may not seem worth the time spent. Thankfully, the adage "Less is More" applies well to Twitter marketing. Twitter is the schizophrenic equivalent of a rolling newsfeed, rapidly delivering content from various sources to the users’ specifically tailored account page. Unlike Facebook, where long, content rich messages are prevalent, Twitter offers individuals and businesses 140 carefully chosen characters to deliver the message they feel the world should hear. This is ample space to entice customers to learn more…or completely turn them off of a brand. It takes approximately 10 seconds or less for a customer to read a Twitter post, thus advertising on this platform needs to be concise, to the point, and focused on the actual value proposition. Perhaps the most effective way to use Twitter to promote your business is by providing short descriptions and then adding a hyperlink to the full content, continually driving traffic to your site and integrating various aspects of your overall marketing campaign. OffWhite is an integrated marketing firm. One of our major strengths is looking at your marketing plan holistically, incorporating as many leverageable tools as possible to drive interest, and delivering innovative messages that increase sales. Twitter branding is simply one of those tools. Contact Jane Cirigliano today at 800-606-1610 or visit our website to learn more.